P90X2 is on the street! Now all you need is to maximize your workouts by tracking your progress. 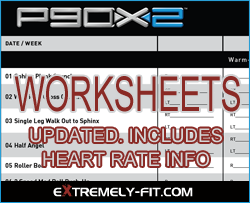 Below you can download the P90X Worksheets. These are the official Beachbody worksheets on steroids. Well, not really, that would be illegal. 🙂 But what I have done is added a place to track your heart rate information as well. If you are fanatical about tracking HR data, now you have a place to put it. I have also revised the worksheets slightly. On the X2 Total Body workout and X2 Balance + Power workout, there were some slight errors. I corrected the errors, to eliminate any confusion. Here they are! Current version is Revision 2. As I find additional improvements and/or necessary changes, I’ll add them and change the revision appropriately. Bookmark this page. Read all my P90X2 Reviews here. I am reviewing every workout as I complete the program. Check it out! Additional P90X2 Downloads coming soon!